For the first five months of this year, Washington state has stood out as the only state in the U.S. with a below-average temperature. While most of the country was experiencing warmer-than-normal temperatures, we here in Washington were going outside to temperatures that averaged nearly 1 degree F. below normal. 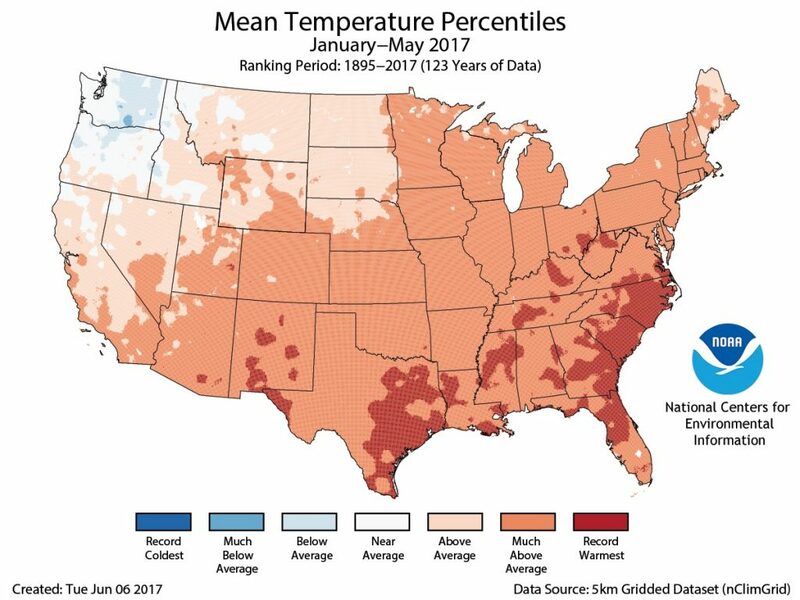 In fact, the contiguous 48 states recorded the second-warmest January-through-May period on record, despite cooler conditions in Washington. Average temperatures were 1.4 degrees F. below the record set in 2012 for the same period, according to NOAA’s National Centers for Environmental Information (PDF 4.2 mb). Click on maps to enlarge. 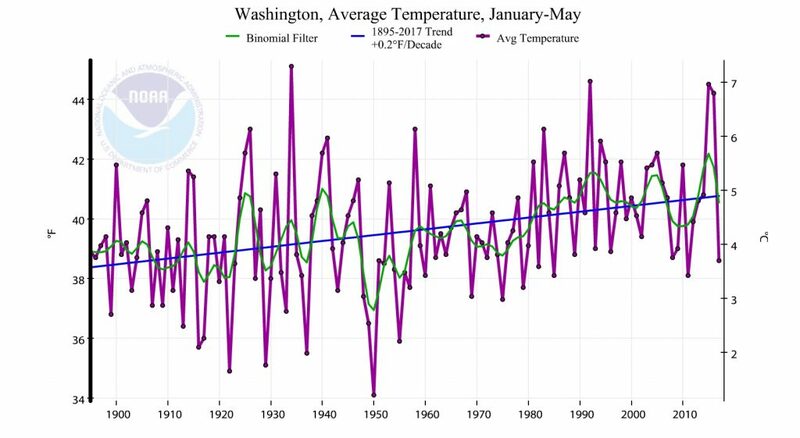 The average temperature in Washington state was 38.6 degrees for the first five months of the year, compared to an average of 39.4 degrees for the 20th century. Out of 124 years on record, it was the 35th coolest for the five-month period, the coolest since 2011. The coolest on record was in 1950. Forty states were much warmer than average during the same time period, with Florida, Georgia, North Carolina, South Carolina and Texas reaching record-warm levels. 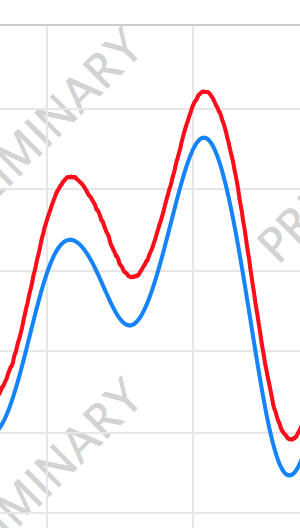 Of course, temperatures can vary greatly from year to year, but climate conditions in Washington, as in most of the world, demonstrate an increasing temperature trend since records began in 1895, as shown by the blue line in the graphic. 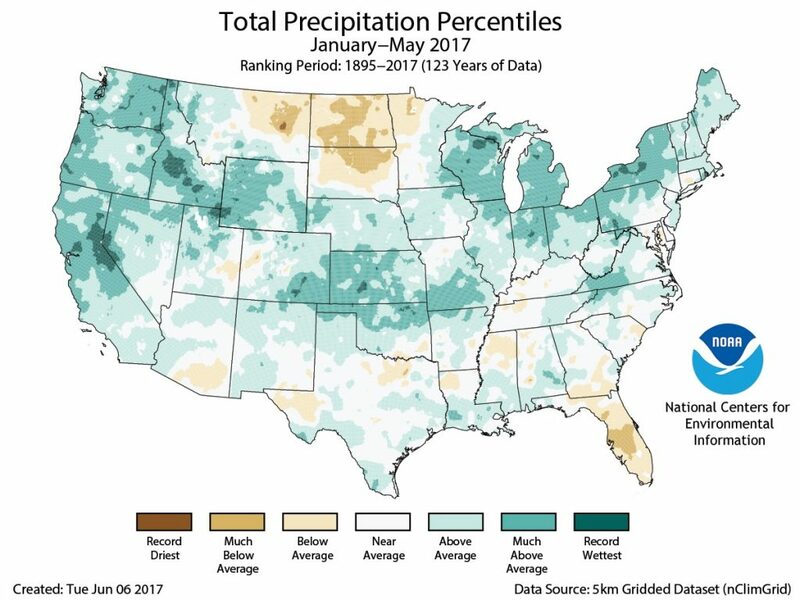 The country as a whole has also been much wetter than normal so far this year. Average precipitation across the lower-48 has reached 14.85 inches, which is 2.46 inches above average and the fourth wettest January-through-May period on record. 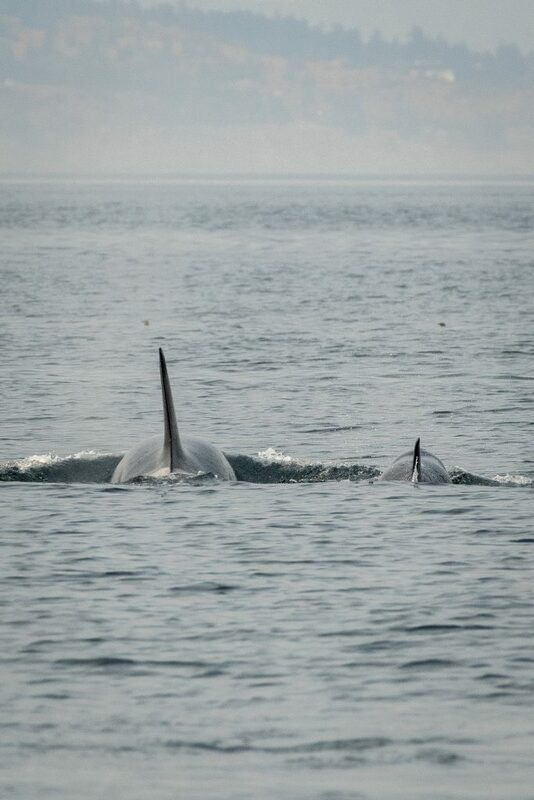 It is also the wettest first five months since 1998. 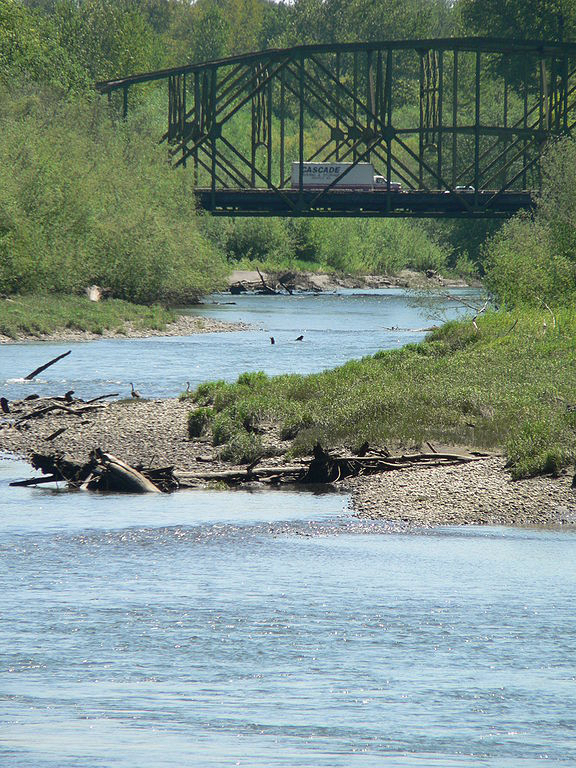 Washington state was 6.78 inches above the 20th century average of 20.03 inches for the five-month time period. This year was the sixth wettest on record. Washington and five other western states were listed as much above average for snow and rain, while Idaho reached record precipitation for the first five months of the year. Record flooding was reported in the mid-Mississippi Valley. Below average precipitation was seen in the Northern Plains states and Florida. Meanwhile, about 5 percent of the lower-48 was listed in drought conditions on May 30, up slightly from earlier in the year. Drought improved in the Northeast, Mid-Atlantic and Southeast, but it worsened in the Northern and Southern Plains and in Florida.